“What are some myths that are popular in our views of the American War for Independence?” I asked my brother when I was outlining this series a few months ago. “Well, we think the British soldiers were sort of monster-like. And we don’t have much respect for their generals. What happened to Cornwallis after Yorktown, anyway?” was the answer I got. Now, I’m patriotic, and I love my country. (So, don’t tar ‘n feather me for the next statement.) I like to look at both sides – their views, military, politics, and leaders – when I’m studying a war. And, yes, that means I found some interesting things about British soldiers during the 1770’s. Oh, and Charles Cornwallis was the not as bad a guy as we’ve all heard. And he didn’t return to England in irreparable disgrace.There are two “ideals” or images that I used to think of when talking about Lord Cornwallis. The first was his excuse not to be at the Yorktown surrender because he was ill or indisposed or something…and sent his second-in-command to hand over the sword. The second that he was a pompous fellow ruled by extreme pride. 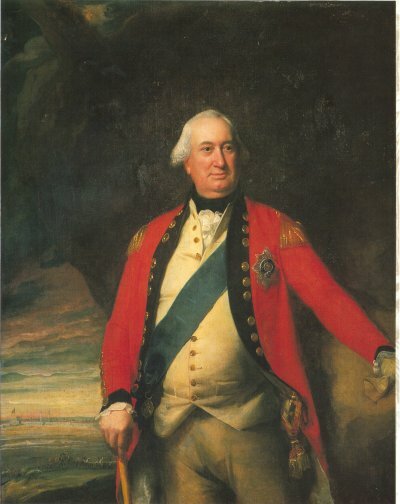 Born on December 31, 1738, Charles Edward Cornwallis V was an aristocratic of high ranking family. He was given a good education at Eaton and Cambridge, then joined the British army in 1757, during the Seven Years War. Five years later – after his father’s death – young Cornwallis took the title “Earl” and a seat in the House of Lords. The army was more to his liking though, and in 1762, Lord Cornwallis became the Colonel of the 33rd Regiment of Foot. He married in 1768 and had two children. Sent to America to help crush the rebellion, Cornwallis won a decisive victory at the Battle of Camden in 1780. However, he quarreled with his superior officer – Sir Henry Clinton – on the best ways to fight the campaigns in the Carolinas. Several set-backs followed including the defeat at the Battle of Cowpens, orchestrated by American General Dan Morgan. Eventually, Cornwallis headed north into Virginia and down the peninsula to Yorktown, expecting to be “rescued” by the British fleet and taken back to New York. It wasn’t a terrible plan; after-all, the British navy was the best in the world and routinely beat the French. However, the Americans established siege lines, the French defeated the British at sea, and further escape attempts were curbed by a bad storm. Lord Cornwallis asked for surrender terms, and on October 19, 1781, his British Army surrender, ending most of the fighting in America. I think most of us suppose Cornwallis got in big trouble with King George III. Well, not really. Kings don’t usually bestow the honor of knighthood on eternally disgraced subjects. 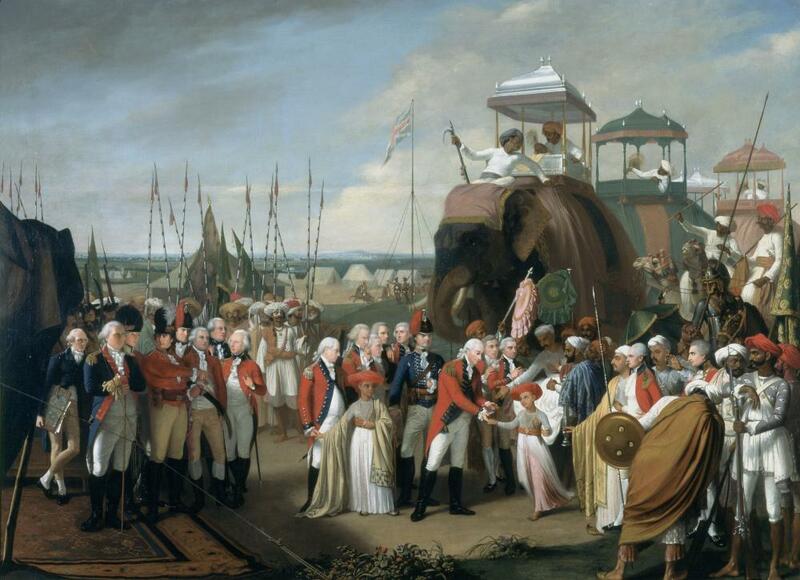 And yes, in 1786, Cornwallis was knighted and given the positive of Governor-General and Commander in Chief in India. India was a British colony and a huge trading empire under the control of the East India Company, which was kind of like a country on its own. During his years in India, Lord Cornwallis reformed the laws and practices of the East India Company and establishing better relations and more control from the British government and military. He also fought against some more colonial rebels in the Third Anglo-Mysore War (1789-1792). Ironically, Cornwallis accepted the surrender and hostages from the rebellious Indian Sultan. Returning to England, he was honored with the position of Master General of Ordinance and in 1798 took the post of Lord Lieutenant and Commander in Chief of Ireland. It was a turbulent time in Irish history, with an attempted revolution aided by the French. (It didn’t work.) Cornwallis represented Britain and signed the Treaty of Amiens for his country in 1802 – this treaty temporarily ended fighting between England and the new revolutionary Republic of France. Cornwallis was not (and still isn’t) a popular guy in American History. Okay – I get it – he was the enemy. And he was trying to fight a European War in the American “wilderness” and that comes across as a little ridiculous. But…think about it. Cornwallis was nobility; he was used to structure and order, and colonists rebelling against the king was not going to be his cup of tea. He was a military man, trained in European warfare. He was devoted to his country (Britain). Yes, it must have been an awfully hard day when he had to surrender at Yorktown. Yet, he didn’t fall into a life-long melancholy. He went on and served his country in other conflicts and diplomatic challenges. I’m not saying Cornwallis has to be your favorite historical character, but let’s be gracious and try to understand his position – his duty to king and country. We can certainly approve of his reforms in India and his role in completing the Treaty of Amiens. And…what if…just what if…he really was sick on October 19, 1781…maybe we’d have a little more compassion for him? Late reply I know but what a superb post about the great man, Lord Cornwallis, I just had to comment. So nice to hear a more positive review from an American perspective. I’m Indian and live not far from the tomb of Cornwallis which stands on the banks of the Ganges. Contrary to negative views of colonial figures, Cornwallis is viewed with great affection here. He was a kind and fair leader. Reading about his life I was sad that his wife Jemima blamed him for getting sick. Cornwallis was in Virginia when she fell ill and he tried to get back to England as soon as possible. Jemima died blaming him and broke his heart. He loved her dearly. Many time I have visited his tomb and left flowers. Thank you for this lovely reply; made my day! How interesting to hear how Lord Cornwallis is remembered in India. That is sad about his wife – I hadn’t heard about that before, but now I’m curious to research that human interest account. Thank you for leaving flowers. It’s a kind way to show respect to historical figures.